Bird watching is a late hobby of mine but it is one that is going to stay with me. 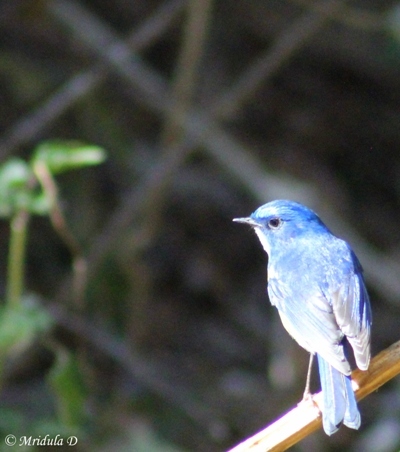 On many trips, I just do not get time to click any birds. Not so at Hail Himalayas. I saw many and managed to click three birds, two of them for the first time. 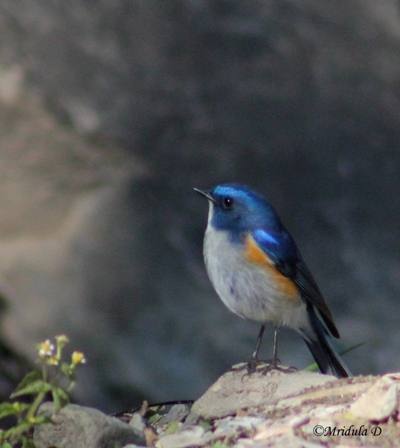 I saw this bird for the first time when I was walking to the waterfall. It paused for a while but I had a 11-16 lens mounted on my camera. And even before I could think of changing lenses it flew away. 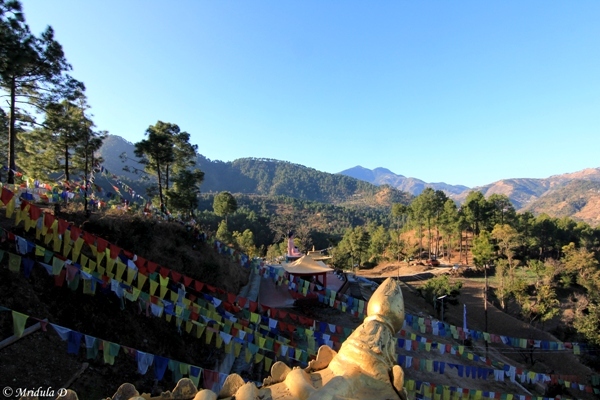 Later it came to the Hail Himalayas campsite itself and then I had the leisure to click it. This is how the bird looks from the top. I could manage the id via Indiamike Bird Thread. I just do not know what I would have done if the kind folks at the thread would not keep identifying bird after bird for me. 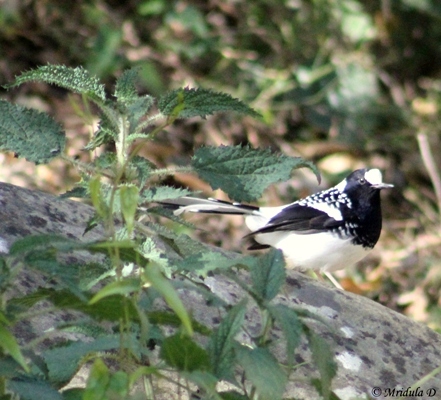 This is a partial view of a Forktail. It has a long tail and I could capture only a part of it. The tail is forked, hence the name Forktail. This is also a first sighting for me. These days the backyard hardly ever yield any new birds! 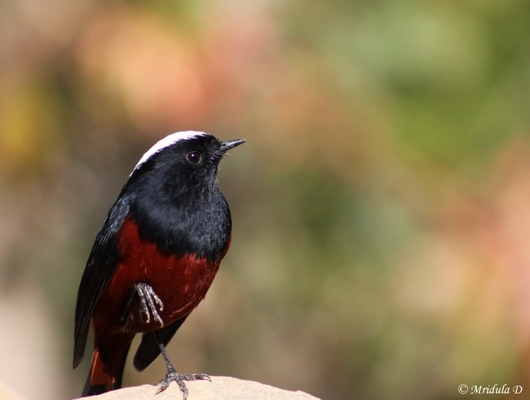 I have seen White Capped Redstart many times. It is a faithful at the bank of the Ganges at Rishikesh, I have seen it at Jim Corbet too. When found near habitation my experience is that is is quite fearless too. This one was near the temple next to the waterfall. It let me creep quite close to it. And while you read this, I am off on a vacation (no invitations, my own personal vacation) to Gujarat. The idea is to try and reach the Runn of Kutch. I picked up Gujarat in the end because it would not be cold at this time of year! What do you do when go and search on Google and find only your own post on the topic? 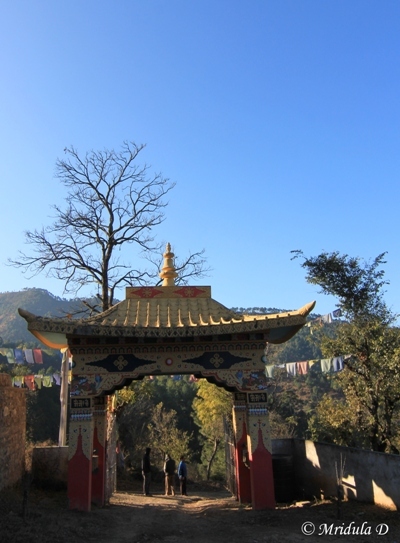 I searched for the Jangchub Rabtanling Monastery near hail Himalayas and found my own post looking back at me! So I go ahead and talk more about it. 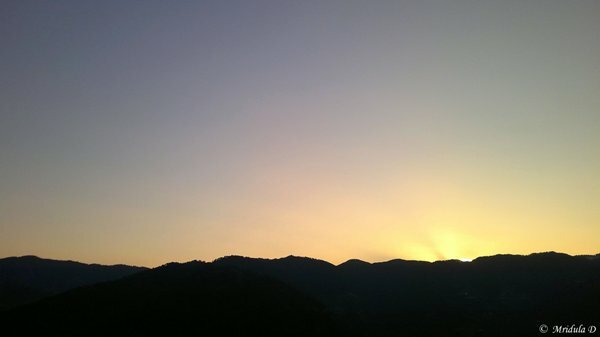 I don’t know why I agreed to get out to see the sunrise on a cold December day at Hail Himalayas. But when we started the car, ice had to be wiped out of the wind screen first. 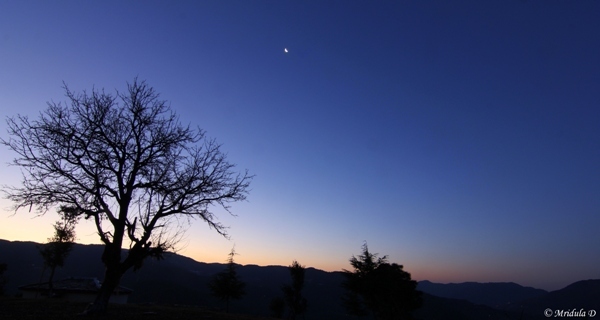 It was still dark outside, moon was still there when we reached the sunrise point. It was cold but as I trek, I was wearing a good down jacket and there was no chance of feeling cold. The tiny dot you see in the picture above is the moon. Of the sunrise I don’t have much to show. As we reached there quite early, no one had the patience to wait for the sun to come out properly. We were going near the Jangchub Rabtanling Monastery as two of the instructors with Hail Himalayas lived nearby and they offered us tea. Or probably it was the other way round, we were going to the monastery and there was a chance for tea nearby. Both the young lads who worked with Hail Himalayas have done advanced mountaineering course. The tea that their family offered was really good pahari chai. The Monastery was a quiet one and we were the only visitors that early in the morning. 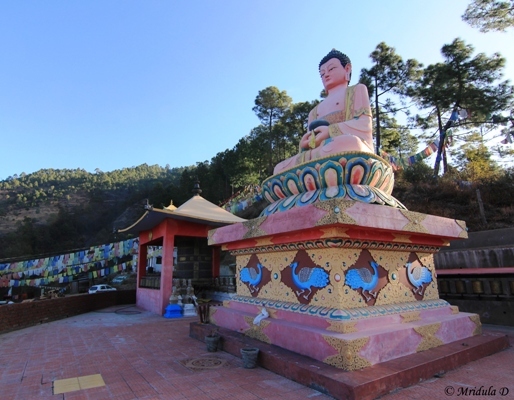 Mr. Hem Singh Thakur of Hail Himalayas has spent a long time in Trans-Himalayan region and he very quickly started chatting with the head lama who was showing us around. To see the main hall of the monastery we were barefoot and I was freezing while I was thus standing and trying to get a good picture of the fabulous view around the place. 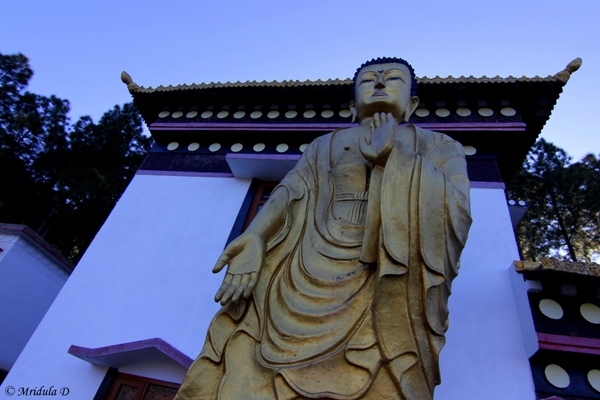 I was quite fascinated by the giant Buddha statues at the monastery. The place is quite remote and it must have been a task to construct this place out here. This is another giant statue within the premises. Like every other monastery this one also had its own dogs. Looks like I am becoming a little less scared of them these days. I would still not go and pet them but I didn’t make a fool of myself either! Now that I am writing it this, I feel I should have asked more questions about the place. If you go there find out more as there is hardly anything as of now on Google! I love walking, there is so therapeutic about it. To me a nice holiday always includes a walk. 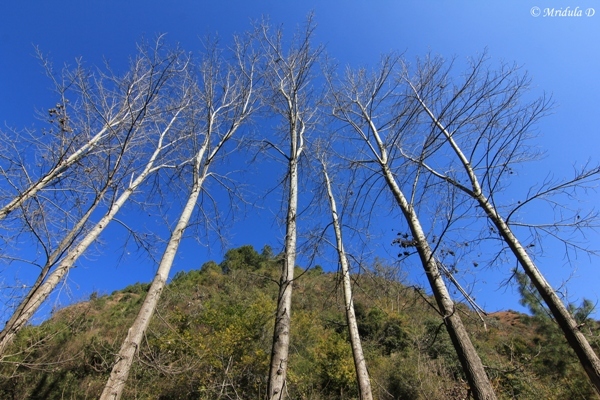 And the holiday with Hail Himalayas (on invitation) was super nice because it included a trek to a waterfall. It was a nice, clear day with blue skies. While walking it is also never too cold. Jeevak, Vinod and I did the Waterfall Trek with the Hail Himalayas. Vinod was the local boy, our guide. It was a fascinating trek in a way. The path crisscrossed a shallow stream. 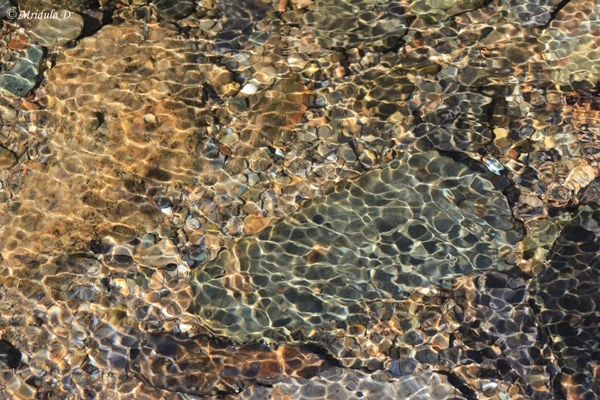 The only way to cross the stream was by leaping from one stone to another. I have already fallen once with my camera in sea, I had no desire to give a watery death to my new love. So, I was extra careful while leaping from one stone to another. The path must have gone across the stream at least 20 times (not really but that is how it felt). At the most difficult places the camera went into the bag and the bag went to Vinod. There was no chance of him falling in the stream! The stream was quite shallow which was a good thing. It meant at the most the shoes would get wet, if I took an uncoordinated step! I came very close to getting some real cold water into my shoes but at the last moment I somehow managed to leap that extra two inches to land on terra firma! 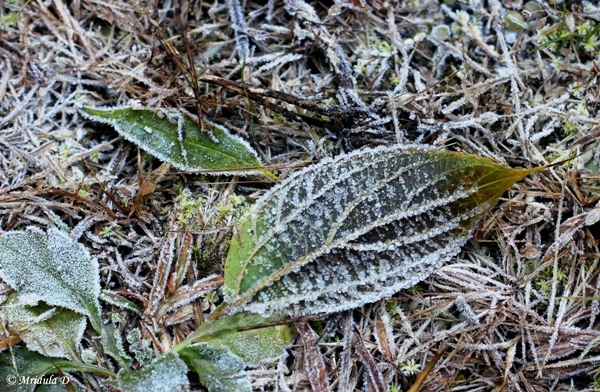 Even though it was a sunny day there were parts where the sunlight was blocked by foliage and that meant frost. However, there were not too many patches like this. The path apart from the stone leaping bit was easy. It was a gradual walk for most of the way. Quite close to the waterfall there is a temple and that bit was uphill. It took us 45 minutes each both ways. However, that afternoon another group of youngsters tried walking to the waterfall and I was told they gave it up mid way. Maybe they were short of time. The walk is not difficult if you ask me. 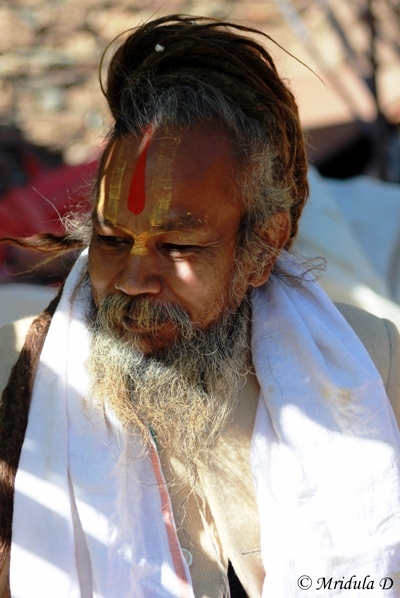 There was a group of Sadhus at the temple. They offered us water and asked if we would like to have tea as well. As we had a cup of tea before we started and we were yet not at the waterfall we declined. The way goes sharply down from the temple. I would not have been able to climb down it but for the wires fixed along the way. With the wires it was quite doable. 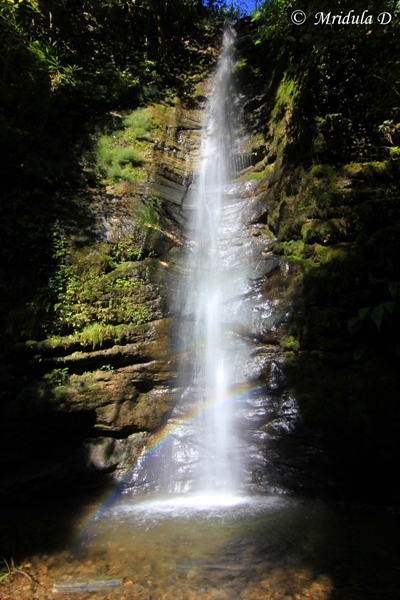 I was really lucky, I got the waterfall with a rainbow. There is a small shrine devoted to Lord Shiva right next to the waterfall. As it was December I was content watching the waterfall, it looked cold and uninviting. Jeevak told me that in summer they approach it via the stream and not through the temple. While coming back we rested at the temple again. 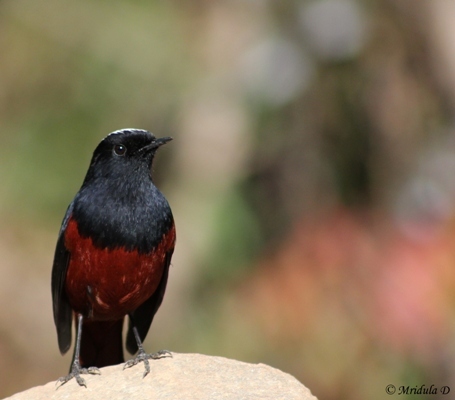 This White Caped Redstart was quite at home near the temple. It would let me get quite close. The sadhus lighted a chilum and asked my companions if they would like to have a puff which they declined. They offered chikki as prasad which we gladly took. After another glass of water, we were ready to head back to lunch. The day was still sunny. 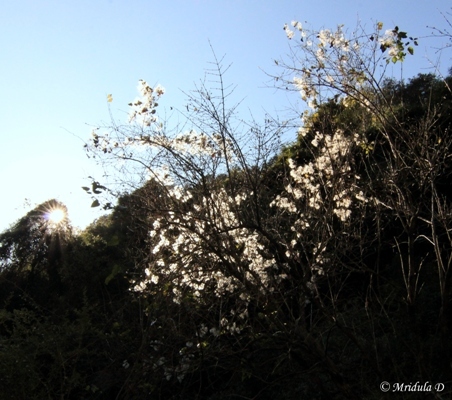 I didn’t expect much of vegetation in December but I was happy to catch the sunlight on these white blossoms. It was a beautiful walk, unusual too because of the stone leaping involved. If you wish to give trekking try I would say try this (or a similar) small walk. At Hail Himalayas you get a tented accommodation too. If you like it, you may decide to go for longer treks and sparser accommodations. Otherwise you could write it down to experience and just enjoy the tents with hot water and a bed and other luxuries.